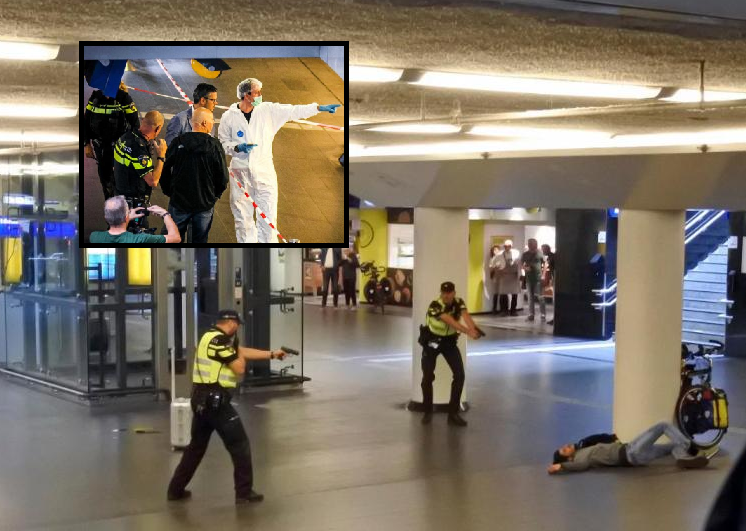 A stabbing of 2 people and subsequent shooting of the suspect in Amsterdam’s Central Station led to a lot of speculation in the Dutch press on Friday although authorities did not want to confirm whether its related to a possible terror attack. However, by Saturday morning reports show up in the neighboring German press that Dutch police are enquiring about the 19-year-old Afghan refugee suspect whom they’ve shot. Investigations are being held to check whether the young refugee had possibly been radicalized or was even part of a wider terror cell. Firstly, the Dutch police were very reluctant to release any details and authorities did not want anyone speculating in the press on a possible terror motive. For them to admit 9 hours after the events that the suspect which police held at gunpoint around noon was a 19-year-old Afghan refugee who severely injured two travelers whom he didn’t know is seen as trying to trick the general public. The events come on the same day that Dutch politician Mr. Geert Wilders decided to scrap his controversial ‘Mohammad Cartoon Contest’ after it became known that he had received hundreds of death threats and that the Dutch soldiers abroad were being threatened. Related coverage: <a href="http://thegoldwater.com/news/35676-Germany-Neighbor-Countries-Issue-Travel-Warnings-Over-Weekend-Rightwing-Rallies"> Germany - Neighbor Countries Issue Travel Warnings Over Weekend Right-Wing Rallies</a>. Right-wing mass protests will be organized in Germany this weekend. Bild, Germany’s largest newspaper, opening with the news of a 19-year-old Afghan refugee from Germany stabbing 2 in Amsterdam is not the most welcome news for authorities. There is speculation on social media whether Dutch media was trying to withhold information not to enflame tensions in Germany. Dutch PM Mr. Mark Rutte is mostly seen as a staunch ally of German Chancellor Ms. Angela Merkel.